In 2010, the overall number of uninsured swelled to 47.2 million, an 8.5 percent increase from 2008. However, there was better news for America’s children in 2010, as Medicaid and the Children’s Health Insurance Program (CHIP) helped families secure coverage even as many more children found themselves living in poverty. The number of children in poverty increased significantly from 13.2 million in 2008 to 15.7 million in 2010. Yet the number of uninsured children decreased from 6.9 million in 2008 to 5.9 million in 2010. 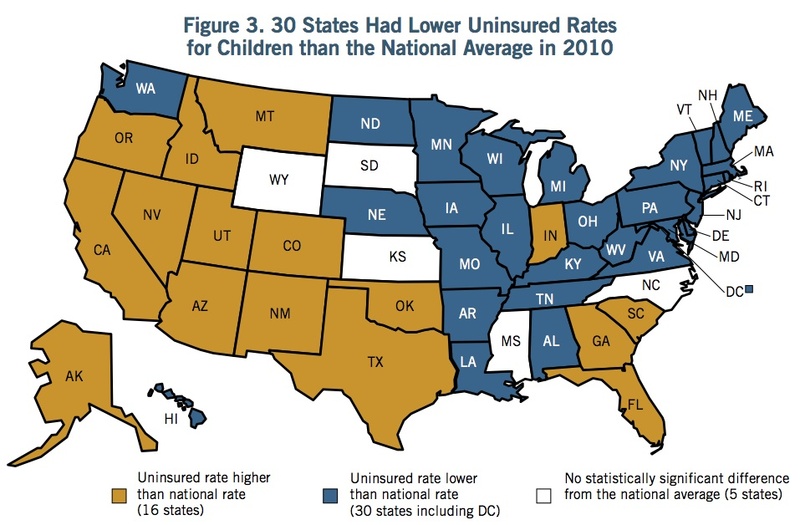 In other words, despite the fact that the number of children living in poverty increased by 18.9 percent, the number of uninsured children decreased by 14.0 percent– a true bright spot in an otherwise challenging landscape for America’s children. Of course, the cynic in me can’t help but point out that this still leaves almost 6 million children in the richest country in the world without health insurance. That’s not by their “choice”. I bring this up because as we talk about slashing Medicaid funding, I feel compelled to remind all of you that Medicaid is really a program for poor children and poor pregnant women. The program covers one in three kids in the US, as well as one in three births. Cut Medicaid severely, and you will make this bit of good news vanish. I hope the states in yellow below think hard about that. That includes you, Indiana!